Perhaps the first famous Big Band leader, Kyser performed with Ish Kabibble and singer Harry Babbitt, scoring eleven #1 records in the 1930's and 40's. When singer Babbitt was called to service in WWII, replacing him was Don Leslie and future talk show host Mike Douglas. 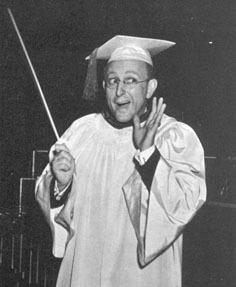 In addition to the music, Kyser hosted the Kay Kyser's Kollege of Musical Knowledge radio program 1937-49, a show comparable to Name That Tune but with slightly more depth. The show was tried on television in the early 1950's with some success, but didn't work nearly as well as it did on the radio. It was tried briefly again several years later, with Tennessee Ernie Ford as replacement host. After Kyser died in 1985, singer Harry Babbitt purchased the back catalogue from Georgia, and performed under the Kyser name until the mid-1990's, one of the last touring remnants of Big Band.